At JSU Double Reed Day, I was FEELING SPENDY! I Bought SO Many NEW BASSOON GOODIES. For a full Video Haul, there is a link below! Out of All of My Purchases Nothing Surprised Me more than My Purchase of the lefreQue System. I was shocked by HOW MY SOUND CHANGED with the VARIANTS of PANELS. I must admit that I went into trying them thinking “Nope. No Way. They’re WitchCraft. Dumbo with the Feather.” So you can imagine my surprise when I liked them so much I bought my own set! 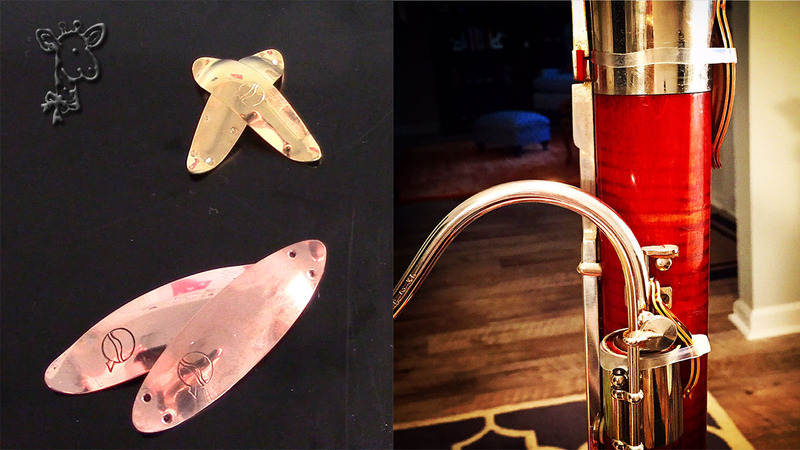 I’ve been using the Gold both Upside Down and Right Side Up for Sound Variations on the Bocal and Wind Joint! They are pictured here UPSIDE DOWN. I’m just so Curious About these doodads that I feel like I NEED TO KNOW and TRY EVERYTHING! After purchasing the panels, I wanted to know more about how they work and what they do. I started at the lefreQue website and earned an endorsement from Kim Laskowski, Associate Principal Bassoon of the NY Phil. No huge surprise, as when I was speaking with Justin Miller of Miller Marketing, he mentioned Specific Orchestras Bassoon Sections ALL using the Same Matching Combinations. Picture Courtesy of Lynn Hileman. Then a colleague mentioned the research by Lynn Hileman and her Blog “TO LEFREQUE OR NOT TO LEFREQUE?” In her research, Lynn charts how the Overtone Series is altered on different bassoons with the Silver lefreQue System, playing the same passage on each instrument, recording it, and analyzing the overtone series. It’s truly fascinating. And worth the Read! SIDENOTE: I have spoken with Lynn Hileman and her tests were all done with ONLY SILVER. She is preparing to do the tests again with different panels to note similarities and differences. In case I have sold you on these magic little pieces of metal- here are a few of my thoughts based in my experiences. I like to think of this like Matching a Bocal to a Bassoon. Not All Bocals will Suit EVERY Instrument. Try and have Friends and Colleagues Listen for a Helpful Critique. You will Feel and Hear what works best FOR YOU. For My Bassoon, I found the best match was Brass on the Bell to the Long Joint and Gold on the Bocal to the Wind Joint. After trying variations of all the possible matches- this is what offered the WARMEST, RICHEST, EASE OF PLAYING. SIDENOTE for the Curious: My set up is a HECKEL 10,000 SERIES with a HECKEL C2XL BOCAL. I have had several colleagues and friends try my sound panels on their instrument and it made NO NOTICEABLE DIFFERENCE. In my own experience with this, it is usually the Less Flexible and Less Expensive instruments that have Little to No Change in Sound or Resistance. But it is ANOTHER REASON TO TRY BEFORE YOU BUY! I am not a believer on buying a product to “fit in.” If it helps BUY IT. If not- LEAVE IT. I hope you Enjoyed! Be Sure to Leave me a Comment if you are Interested in Purchasing or ALREADY OWN A SET! I’d love to hear about your Experiences. Here is a HAUL OF ALL OF MY JSU DOUBLE REED DAY GOODIES PURCHASED! Eryn..Just found your videos..have watched several and enjoyed each of them. I currently play an older (1985) Long Bore Fox Model II with keywork very similar to a Renard 220 with the addition of the offset D/Eb trill key. Don’t know if I would have it added to my next instrument. Usually use Fox#1 straight Shaper, also occasionally use a Herzberg Copy from Miller. I, too, am a cane hoarder, with a couple hundred pieces of Gouged Cane upstairs in my reed room. Mostly Silvacane with some Danzi, Alliaud, and Rigotti. I’ll go for now, but I do hope you continue your enjoyable videos.